Read what the client has to say about this project. Heavy Content managed an innovative e-media presentation project for Nationwide Realty Investors (NRI). 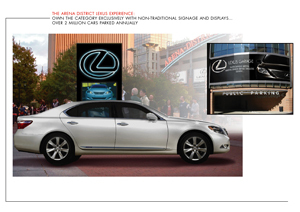 NRI offers outdoor advertising opportunities throughout the Arena District in downtown Columbus and wanted to develop new, non-traditional concepts for an experiential marketing program. Heavy Content generated new ideas for the program, then produced a customizable Flash presentation template that could also be output as a printable PDF. The customizable sales presentation has become a marketing staple for NRI outdoor advertising and has resulted in annual contracts with a major cable service provider and a national beer brand. Contact Heavy Content at 614.638.5530 or service@heavycontent.com. Heavy Content provides marketing communications, public relations and social media management services for clients in Columbus and Central Ohio. 2003-2010 Heavy Content, Ltd. All rights reserved.